Dr. David Zhang is a pathologist who currently lives in New York. He has an overall medical experience that covers more than 20 years of practice. Moreover, he is also a reputable pathology professor and associate professor of environmental medicine and public health. Dr. Zhang graduated the medical school of Norman Bethune University and completed his residency at the Mount Sinai Hospital where he practiced both occupational medicine and anatomic & clinical pathology. 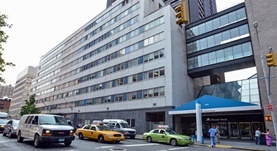 He completed his medical training with a fellowship at the Mount Sinai Hospital. He is certified by the American Board of Pathology in anatomic and clinical pathology, cytopathology and molecular genetic pathology and he also owns a recertification in pathology. He collaborated in various medical articles that have been published. Some of the topics he covered were: molecular genetic pathology, mesothelial cells, isothermal DNA amplification, the classification and prognosis of gastric cancer. Dr. David Zhang is currently affiliated with Mount Sinai Hospital. Dr. David Zhang has contributed to 3 publications. Serrated colorectal polyps in inflammatory bowel disease. Ko, H. M.,Harpaz, N.,McBride, R. B.,Cui, M.,Ye, F.,Zhang, D.,Ullman, T. A.,Polydorides, A. D.; Mod. Pathol.. 2015 Sep 26. ACSL4 promotes prostate cancer growth, invasion and hormonal resistance. Wu, X.,Deng, F.,Li, Y.,Daniels, G.,Du, X.,Ren, Q.,Wang, J.,Wang, L. H.,Yang, Y.,Zhang, V.,Zhang, D.,Ye, F.,Melamed, J.,Monaco, M. E.,Lee, P.; Oncotarget. 2015 Dec 05. RSK1 Activation Promotes Invasion in Nodular Melanoma. Salhi, A.,Farhadian, J. A.,Giles, K. M.,Vega-Saenz de Miera, E.,Silva, I. P.,Bourque, C.,Yeh, K.,Chhangawala, S.,Wang, J.,Ye, F.,Zhang, D. Y.,Hernando-Monge, E.,Houvra...; Am. J. Pathol.. 2015 Jan 13.